College of Fine Arts and Production voice professor Rachel Velarde, seated at a hallway table with a stack of colored Grand Canyon University campus directory maps at the ready, directed students like the guru of orientation that she is. It was a scene repeated throughout the morning as students, gripping their schedules, oriented themselves to the always evolving campus. It’s been a summer of change, as it always is at GCU, with colleges such as the College of Nursing and Health Care Professions and the College of Theology switching spaces, the massive new Colangelo College of Business Building (CCOB) opening, a new Lope Shop relocating to its five-times-larger-than-before space in the old Fleming Building on the Promenade, a new Canyon Activities Center, garage, residence halls and more. But it was an especially robust morning at COFAP. Just a few months ago, fine arts faculty and students were peppered throughout campus in different buildings – the costume shop in the Media Arts Center on the Promenade, many faculty offices and music practice rooms in the onetime Colter Complex, a faculty office or two and classes in the Ethington Theatre building. But on Monday, the fine arts and production college opened in the old CCOB facility, where many faculty found themselves under the same roof for the first time. Sophomore worship ministry major Joseph Vaught, who took voice classes in Colter in 2017-18, was waiting in one of the hallways for his private vocal instruction class in the College of Fine Arts and Production: “It just feels nice and fresh,” said Vaught. 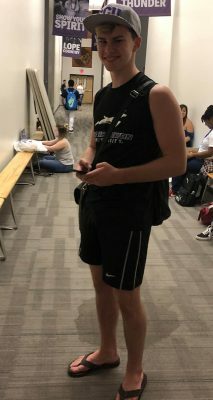 Freshman worship arts major Jacob Holleman said he is still getting a feel for where everything is on campus but already feels at home. 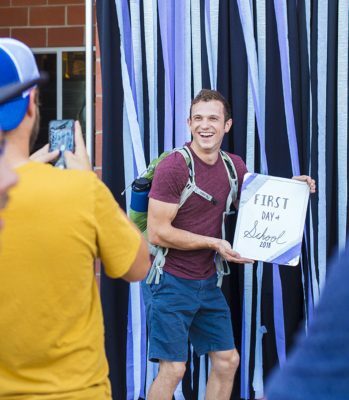 Freshman worship arts major Jacob Holleman, who’s from Dallas, was bright-eyed on his first day. He moved into his residence hall Tuesday and already was feeling welcome and right at home. 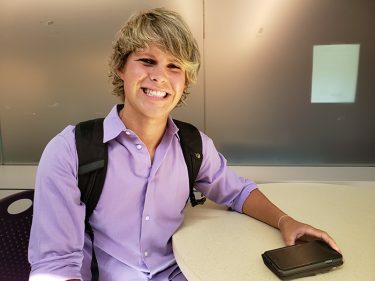 Holleman said you have to try hard NOT to make friends at GCU, he said, after a week of welcome activities, such as Lope-a-Palooza and the Glow Party. “I attended them all,” he said with a laugh. Across campus, College of Science, Engineering and Technology Academic Program Manager Melissa Davis was making her rounds on the fourth floor, stopping into classes to welcome students and to remind them to check into LoudCloud, the University’s learning system, to make sure they’re enrolled in the class and all is good in the scheduling world. Davis, wearing a big purple “Ask Me” button, arrived on campus at 4:30 a.m. to print schedules and get everything ready for the day. She is part of the three-team member Success Patrol for CSET today and tomorrow. “I direct everybody in Building 1 to their classrooms,” said Davis, who on Friday visited the classrooms with other team members to make sure professors had a supply of markers and other teaching tools they might need. Paige Gutierrez, a junior pre-physical therapy major from Palm Springs, Calif., who works in the cadaver lab, was one of the students who stopped Davis for help. “I had all my classes written down on a piece of paper. I went to LoudCloud and everything was changed,” said Gutierrez, who by 9 a.m. already was done with her first class – at 7 a.m.
Like Davis, ACE (Academic and Career Excellence Centers) student workers Charlotte Barber and Jeannette Evins also spent time directing students. They worked a table on the north side of campus, answering questions, primarily from freshmen who wanted to clarify class locations. But they also gave them information about academic help, career excellence, resume reviews and more. 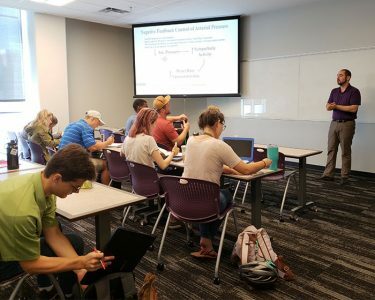 Dr. David Jackson, meanwhile, was teaching his first class in CSET as a new full-time faculty member, though GCU isn’t brand new to him. He was part of the adjunct faculty for three years. He spent part of his medical physiology class time talking about why humans shiver (when muscles move, they generate heat). He said his class was attentive, despite the 8:25 a.m. start time, and he was happy to be a part of the biology department: “They don’t want to leave,” he said with a smile of the rare spot in the department that opened up and allowed him to become an even bigger part of the University. “They like it here,” he said. 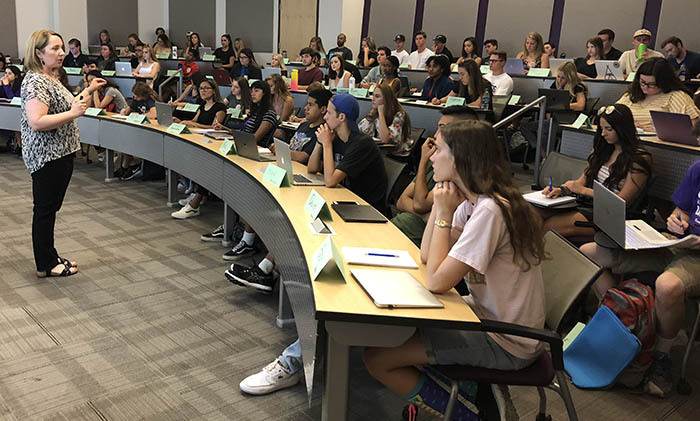 Fifty-three of the 60 freshmen in Dr. David Dean’s Monday morning course were sitting in the first classroom of their GCU career. Only one of them became lost on the way to the Natural Sciences second floor and strolled in after the 8:25 a.m. start — a minuscule tardy percentage to be expected from a bunch of Honors College students. Dean’s UNV106HN class, “A ripple on the Pond: From Idea to Impact,” is a University introductory course made up of all honors students. It’s a bit more extensive than the general University introduction as the students learn such concepts as the Honors College’s five pillars: ethics, leadership, service, research and cultural awareness. “Greater than the tread of mighty armies is an idea whose time has come,” reads a slide from Dean’s first-day presentation. Freshman Jared Reidl, an accounting major, said he was a bit nervous for his first day. Reidl’s older sister attends GCU and he followed suit. 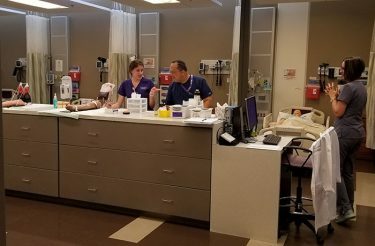 Senior nursing student Kaylin Nickerson (left) practices for an upcoming assessment as professor Michael Hart observes. (Photo by Ryan Kryska). Up on the third floor of the building, Professor Michael Hart was teaching nursing courses NSG430 and NSG320. Senior Kaylin Nickerson, a level three nursing student, was visiting the lab on her day off to practice medication administration. “And that’s why she will be a great nurse,” said Vanessa Slaughter, clinical nursing simulation lab director. Nickerson has an assessment coming up that she must pass to make it to the next phase of learning. She said she is looking forward this year to learning how to take care of laboring patients and children and how to deliver babies. Grace Bolton was relieved to learn that organic chemistry might not be as difficult as she feared. In fact, she felt quite comfortable with the molecular structure part of the lecture. But not everything went well on the first day of classes for the junior from Jasper, Indiana – she left her laptop behind when she left Room 101 in the North Lecture Hall Building. By the time she made her way back to the lecture room, another class had started. 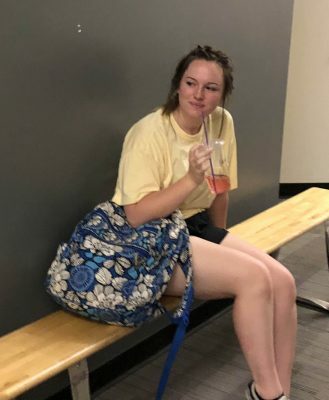 Rather than interrupt, Bolton patiently waited in the hallway, sipping on a GCBC drink and recalling her first class of the 2018-19 academic year, a required class as a premed major. After only 15 minutes of covering class expectations, assignments, grading, policy and professor biography, the lecture began. Down the hall, freshman Matthew Mudrow was 40 minutes early for his first class, Christian Worldview. He wanted to make sure he was in the right place. “I guess that says something about my approach to school,’’ he admitted with a grin. Mudrow’s Houston roots were evident in his polite manners, peppering every answer with ‘’Ma’am’’ but he is quickly making a transition to GCU as evidenced by his GCU hat, Lopes T-shirt, and Welcome Week engagement. The water slide last Monday and the Friday night soccer matches – including storming the pitch after the men’s team upset 12th-ranked Wisconsin 2-0 – are the highlights so far for the informational technology major who plans to play club soccer. 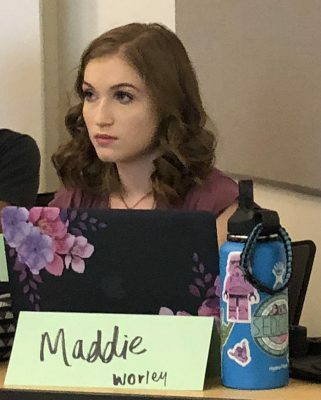 Inside an adjacent lecture hall, Maddie Worley, a freshman commuter from Glendale, found a seat near the front of her Psychology 102 class and readied to take notes from Dr. Laura Chesniak. To start on a personal note, Professor Chesniak and her two Instructional Assistants (IA’s) asked each student to create name placards. The class filled quickly and at the exact start time, 8:25 a.m., Chesniak told her students the most important information for Day 1: the importance of attendance. As she reiterated, the class is not all lecture, it includes hands-on activities and participation points add up, so being in class is paramount. Another first-day order of business was making sure every student was in the right place. She told students not to be embarrassed if they were in the wrong room and needed to leave immediately, recalling the time a student took one of her classes for six weeks before she realized she wasn’t in it. After asking psychology majors to raise their hands, she pointed out the need for the class for non-psychology majors. The fifth-year professor in the College of Humanities and Social Sciences also showed an instant knack for relating her subject matter to students’ lives by using the morning weather as an example of different perception with the same sensation. All students sensed the 95-degree weather on their way into class, but students from Minnesota would likely find that to be an incredibly hot, skin-melting feeling, whereas Phoenix-based students would find that to be a perfectly temperate sensation. Among her other points of emphasis: the class will be a tech-free zone, as in no cell phones or laptops with rare exceptions when they are needed in class. “Technology is a distraction,’’ she said, noting that students have watched movies or baseball games in class, thinking they are on task, but missing information and distracting students around them. Chesniak, who earned her master’s degree and doctorate from Wichita State, also spoke of the importance of students respecting her, the IA’s and each other. 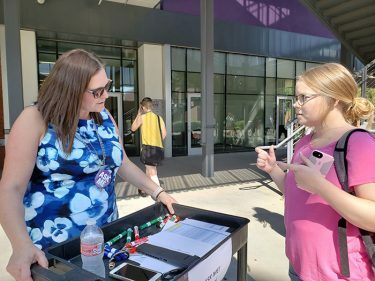 “I find students to be very respectful at GCU,’’ she said — and after the first day of class, also very ready to tackle the academic year. 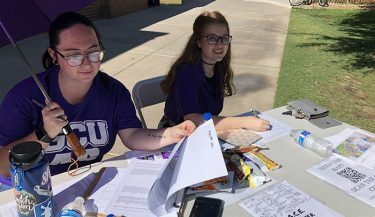 GCU writers Theresa Smith (theresa.smith@gcu.edu), Ryan Kryska (ryan.kryska@gcu.edu) and Lana Sweeten-Shults (lana.sweeten-shults@gcu.edu) contributed to this story.